UPDATE! ATTENTION VIETNAM VETERANS! 3/29/16 Vietnam War Commemoration Program NE Phila. A HERO’S WELCOME WILL BE AT THE SOUTHAMPTON ROAD ARMORY ON MAY 9, 2016 AND MAY 11, 2016 FROM 10:00 AM – 12:00 PM TO DISTRIBUTE YOUR CERTIFICATES. ONLY VIETNAM VETERANS WHO REGISTERED FOR THE ORIGINAL PROGRAM ON MARCH 29 WILL HAVE CERTIFICATES PREPARED. THANK YOU! IT’S BEEN AN HONOR TO PARTICIPATE IN THIS MEMORABLE EVENT. Photos by Jeff ” Bikerider” Story, Thanks Jeff! THANK YOU for your support! We are truly grateful to have the opportunity to present our Hero’s Welcome certificates to close to 500 Vietnam Veterans!!! The number of Veterans who have responded continues to grow. Thank you to the members of A Hero’s Welcome who have volunteered to help, please arrive by 1:00 pm. There will be parking available behind the Armory in the Motor pool area. Please let the guard know you are with AHW and they will let you park in the fenced area and will direct you to the doors available for you to come into the building from the parking area. Please text me if you have any questions or problems. My cell is 610-327-2916. 2700 Southampton Road, Philadelphia, PA 19154. ALL HANDS ON DECK.. A HERO’S WELCOME NEEDS YOU! A Hero’s Welcome will be partnering with the Association of the U.S. Army, the Defense Logistics Agency Troop Support and Corporal Michael J. Crescenz Veterans Affairs Medical Center. We will be presenting a personalized “Welcome Home” certificate to every Vietnam Veteran in attendance and we are asking for members of A Hero’s Welcome to assist with this opportunity to say “Thank you” to our HEROES! Please comment below if you would like to join us on Tuesday 3/29/16 or have any questions. We are asking all volunteers to arrive by 1:00 pm. Vietnam Veterans and their families are invited to receive a long overdue “thank you” for their service and sacrifice on behalf of the United States at this commemoration ceremony. 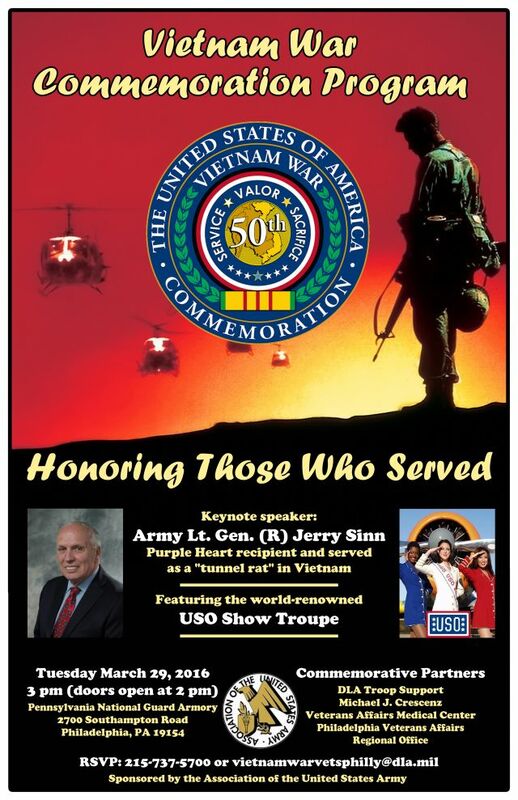 Doors open at 2:00 pmPurple Heart recipient and Vietnam War veteran Army Lt. Gen. Jerry Sinn, Ret., will also provide a keynote address on his experiences as a “tunnel rat” and leader of a Rome Plow team. There will also be a live performance by the USO Show Troupe! Military service veterans who served during the years of the Vietnam War and relatives of fallen veterans, please RSVP at 215-737-5700 or *protected email* to be honored at the program. Within the RSVP, attendees are asked to state their name, telephone number, number of expected guests and if they require special assistance.